Our health and well-being also depends on the quality of the air that surrounds us. At excessive temperatures and in stuffy air body and mind become sluggish. They are in need of a refreshing breeze! A tower fan supplies an innovative solution for noticeable refreshment on your skin. Slim, valuable and elegant: As such the design tower fan of the TVE series harmoniously integrates into any modern living or office environment. Even with the power off, it still brings freshness to the room. But the TVE 40 T is not only visually attractive; quality, performance and technology are equally impressive. Unlike in case of fans fitted with rotors the air flow is here generated by a fin construction rotating inside the device. The vertical axis permits the space-saving construction. 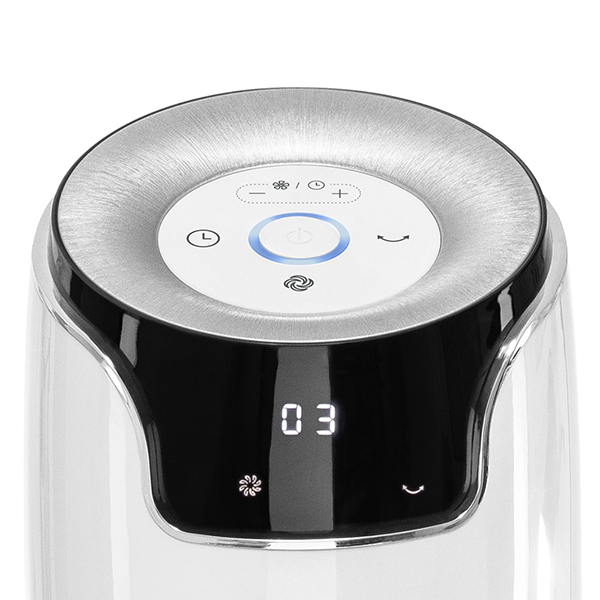 Since the air is discharged along the entire height of the device, the device supplies a consistent, wide air current leading to a perceptibly increased feeling of refreshment. Cooling air current discharged along the entire height of the device for a greater cooling effect. Ideally suited to supply the required refreshment at a desk or table. The air draught always passes just below the edge of the table, thus preventing whirled up paperwork. Reduced risk of accidents in households with children and animals: By saying goodbye to the option of rotor blades for this model you can also bid adieu to the related risk of accidents. With six fan stages the TVE 40 T can create individually available refreshment. Quickly and easily. Directed to a specific spot, a linear air flow can be very pleasant. But anyone preferring an alternating air flow, should use the tower fan's on-demand pivoting mechanism. The oscillation covers a range of up to 60°. That way the fresh air can quickly be distributed throughout the entire room. The extremely versatile tower fan TVE 40 T can supply the desired cooling effect at all times. 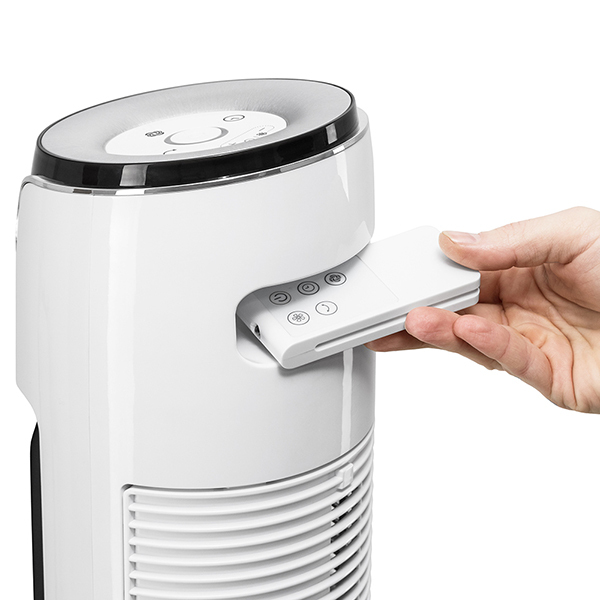 With its different operating modes the fan basically combines three devices in one slim, stylish shell. During normal operation the fan runs constantly, reliably circulating the air in living rooms and workspaces. The guarantee for an agreeable room climate at any time! In low-noise night mode the fan initially operates at a higher intensity to ensure the desired freshness. After a while the ventilation automatically dials down a notch, so that the TVE 40 T emits nothing but a light breeze by night. And the natural wind mode lives up to its name imitating it by an alternately rising and subsiding ventilation intensity. A delightfully natural breath of air! The tower fan TVE 40 T is supplied in SGS-tested quality, thus guaranteeing high value, safety and functionality and making sure that you are always on the safe side with Trotec brand quality. Returning home after a long, hot day at work – who wouldn't like to chill out on their couch in a properly cooled living room? It's worth a little preparation. The quicker will you be able to unwind and feel comfortable in your own skin again. The tower fan TVE 40 T sees to an agreeable room air in due time. With easily made device settings operation starts automatically after a selected number of hours. But the timer function can also be used in the reverse case. You select a certain number of hours after which the device automatically switches off. Pays off quickly: The cooling provided by the tower fan is remarkably cost-efficient as opposed to a permanently installed air conditioning system. And it operates almost as effectively. The TVE 40 T also has extremely low consumption costs, since the device operating on 45 watts does not make use of an energy-hungry refrigerating compressor. Unpack the device and connect it to the mains – that's all it takes! The TVE 40 T is supplied completely pre-assembled and ready for operation. With its appealing, contemporary design the slim and elegant model fitted with a safe, solid base and integrated carrying handle blends in beautifully with almost every environment. The compact dimensions and light weight of only 5.5 kg render the fan suitable for flexible site changes to wherever it is needed. The control panel permits the selection of 6 speed levels, oscillation function, timer, natural wind mode and night mode. The practical holder inside the carrying handle puts an end to searching for the remote control. The automatic oscillation function of up to 60° sees to an optimum air distribution. Waking up fresh and revitalised: The night mode of the TVE 40 T is conducive to a healthy good night’s sleep. More power at the workplace: The TVE 40 T helps to maintain your motivation and productivity in heated everyday office life. Der Turmventilator TVE 40 T sorgt mit seinen 6 Geschwindigkeitsstufen für eine wohltuende Erfrischung. 9.95 € 5.95 € inkl. MwSt. 8.36 € 5.00 € zzgl. MwSt. Der TVE 30 T verfügt über eine Leistungsaufnahme von 45 Watt und sorgt mit 3 Gebläsestufen und der automatischen Oszillation (bis 80°) für eine optimale Luftverteilung. Mit der praktischen Timer-Funktion lässt sich der TVE 30 T nach einer eingestellten Zeit (bis zu 2 Stunden) automatisch abschalten.